Cakewalk, creator of SONAR, one of the most respected and used DAWs on the market, just announced a FREE update for all registered customers of SONAR X1 Producer, Studio and Essential. The X1A is the first of a two-part update that Cakewalk is releasing to better SONAR’s capabilities. 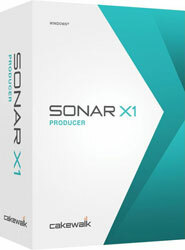 SONAR’s X1B update availability will be announced during the first quarter of 2011 and will address a number of additional issues based largely on customer feedback. The X1A update will address many usability enhancements and overall stability issues across the entire application. Cakewalk fixed some conditions that were causing SONAR to crash, such as drag & dropping after closing the browser tab on multidock, entering a value twice in the step sequencer, adding a new synth to the project after writing automation, closing an open project after a dropout when two or more projects are open, and adjusting ASIO buffer size on the system with multiple Roland audio devices. I bet these new fixes will make a lot of SONAR users pretty happy (not to mention they will hopefully have a few less heart attacks caused by the though of losing hard work via application failures). Some of the effect updates on X1A include: Presets load with enable button in correct state, UI graphically updated during live input, EQ persists correctly when compacted and loads at the same octave it was saved, 4K compressor which no longer crashes if side chain key input is a groove clip, HPF no longer stays on and is more accurate when side chained, and a side chain ON/OFF switch which is no longer backwards when processing mono files. The X1A update also contains fixes on content, accessibility, polishing of the interface controls, and on skylight.